Corporate Responsibility | Corr Analytics Inc. 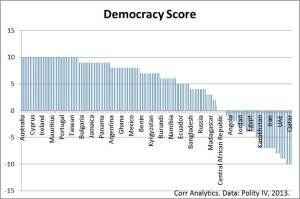 The 2013 Democracy Index ranges from 10 (full democracy) to -10 (full autocracy), and is based on the University of Maryland Polity IV data. It is one metric used to gauge relative stability and social responsibility of investments and sourcing. Corr Analytics assists clients with corporate responsibility and socially responsible investing and sourcing. 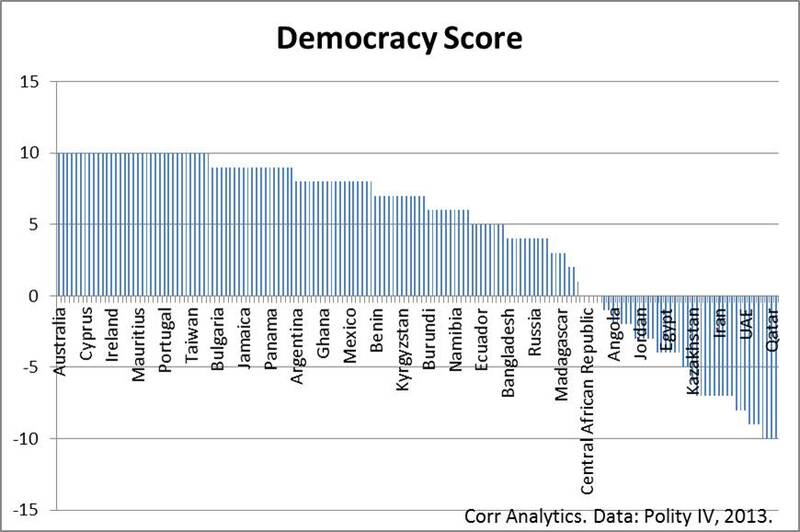 We use a range of quantitative and qualitative data, including open source data on corruption, democracy, human rights, and environmental practices of countries, as well as granular qualitative data on sectors and entities. Through network analysis of political and influence networks, Corr Analytics ensures that clients mitigate reputation risk and optimize portfolios of socially responsible investments and practices.